*Disclosure: This is a sponsored post in partnership with Smiths Food and Drug. I was provided with a gift card to help facilitate this review. Do you ever feel like you just don't have time to run to the grocery store? In between work, chauffeuring the kids and their friends around, making sure there's always dinner on the table, making sure the bills are paid, cleaning the house and everything in between, when do we honestly have time to go to the store. And when we are able to squeeze it in, it can be quite a task to pick up only what we need with kids in tow. Smith's Food & Drug Stores are stepping up to the plate and giving us a resolution to this very problem. 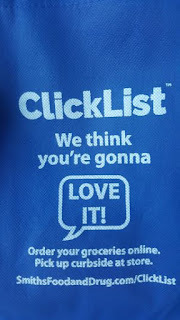 Introducing - Smith's ClickList! **Update** Some locations are now offering same day pickup! 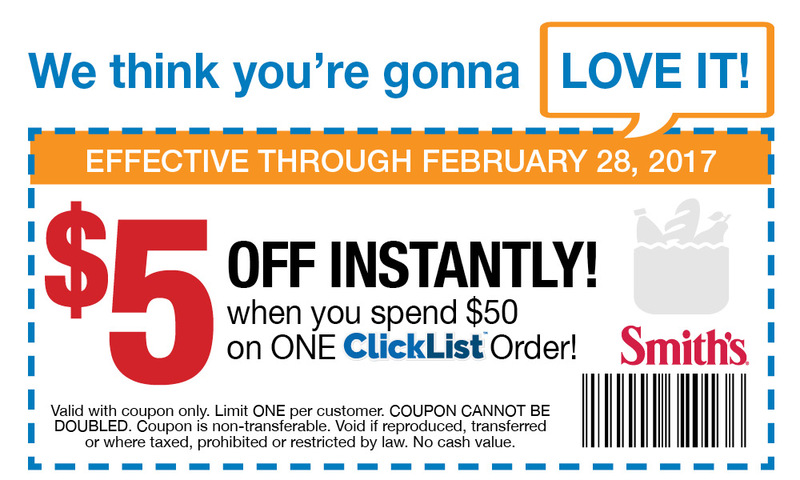 Smith's ClickList is on online grocery ordering service, offering customers 40,000 items you can order directly from your desktop or mobile device for next day curbside pick-up. As a very busy mom and knowing that I end up spending so much more when I take my whole family with me, just thinking of the time AND money I will save using this service. As an introductory offer, Smith's will waive the $4.95 service charge for your first three orders. Once you place your order a specially-trained ClickList Smith's associate then handpicks your items based on personal preferences provided. Special attention is given to the selection of the produce and other perishable items. The products are then stored appropriately until you arrive. 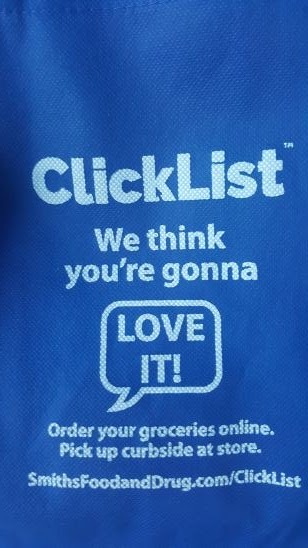 When you arrive to the store, you need to look for the clearly marked pick-up area to notify the ClickList team of your arrival, purchase your order and have the groceries quickly loaded into your car. Over 40,000 items to choose from with more being added! Order selectors will hand select produce, meat & seafood items for each order with quality and freshness as a top priority. You can add specific instructions to every item you select. For example, when ordering bananas, you can specify if you want "green bananas only"
BONUS!! 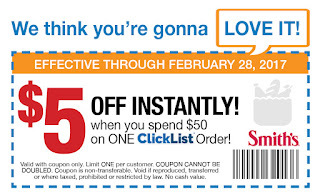 SAVE $5.00 OFF $50 OR MORE!